A Lord of the Rings star has launched a petition demanding the right to vote in the European Union referendum for those living in British Crown Dependencies. 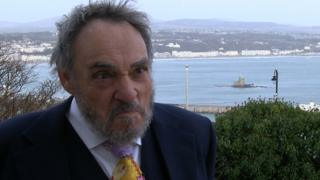 Isle of Man resident John Rhys-Davies, 71, said the referendum was "one of the most important [and] constitutionally significant events in recent times". He said he was "amazed no-one had raised the issue before" with the United Kingdom government. The Welsh actor was allowed to raise the petition as a British citizen. UK Prime Minister David Cameron has promised a referendum on whether Britain should remain in the EU by the end of 2017. Mr Rhys-Davies, best known for his portrayal of Gimli in The Lord of the Rings trilogy, said: "Daily life in the Isle of Man, Jersey and Guernsey is affected by EU decision-making and a decision to leave or stay affects all islanders. "Natural justice requires that islanders have a direct say in such a consequential referendum." As Isle of Man resident for nearly 30 years he continued: "Even if I did not live on the island I would still champion this cause. "The British people should all have a say - if any of us have a say." He added: "I feel very strongly that people of the Isle of Man, Jersey and Guernsey should have their say in a referendum that could change all our lives for a generation. "I'm just a bloke who is British and proud of it and I want a say." The Isle of Man's chief minister Allan Bell said: "As the Isle of Man is not part of the United Kingdom nor of the European Union we cannot expect to be included in a referendum in the UK about its membership of the EU. "But we are remaining vigilant in terms of the progress of this debate and any potential impact on the Isle of Man. The UK's relationship with the EU is one of the major issues that we are monitoring." The UK government will respond to the petition if it attracts 10,000 signatures. It will be considered for a Westminster debate if it receives 100,000.